1. 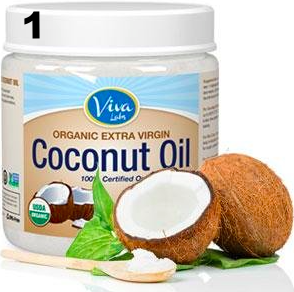 Extra-Virgin Coconut Oil - I use this as my primary skin moisturizer and recommend it for all you dry-skinned peeps out there. It leaves my skin feeling soft and smooth. Plus - it's cheap! Also, you could use it for these chocolate chip cookies!! 2. Clinique Dramatically Different Moisturizer - I've been using this moisturizer for years. I alternate between the coconut oil and this moisturizer every night so that my skin doesn't get used to one moisturizer. Really - there's some science backing this alternating scheme of mine. 3. 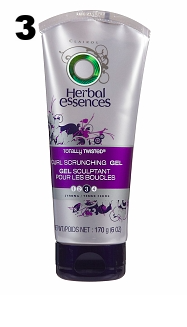 Herbal Essence Totally Twisted Gel - If I'm going straight to sleep after my shower, I don't put anything in my hair. However, if I plan on coming in contact with other human beings after I shower, I use a tiny dollop of this gel in my hair and then blow dry it for approximately 60 seconds with the hairdryer above with the attachment piece shown on the hair dryer. Even though that attachment is meant for straight hair, and mine is super curly, I find it works the best for me. A diffuser makes my hair stringy. Strange, but true. Click here or here for some photos of my hair. 4. 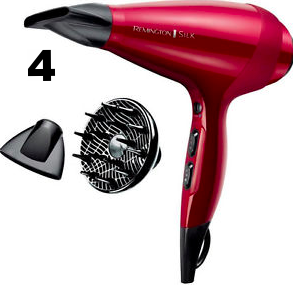 Remington Hair Dryer - Refer to above. I use the attachment piece shown on the dryer in the photo (my hair dryer isn't the one depicted but rather the one I linked to). 5. 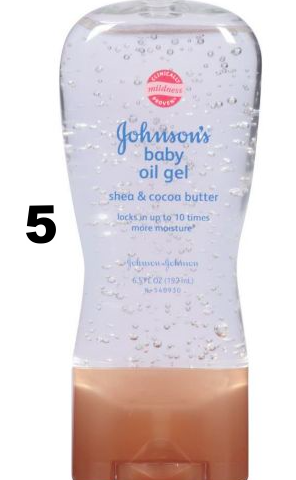 Johnson's Baby Oil Gel - this is my go-to body moisturizer, if I use any. Because if we're being honest, I'm usually too lazy to lather. I have the shea and cocoa butter scent. It smells "mmmmmm......"
6. Neutrogena Ultra Sheer Sunscreen - sunscreen + moisturizer without the oily residue. Win win. 7. Chanel Foundation - this is a (very) new addition to my beauty regimen (regimen is a strong word. I don't really have a beauty "regimen," but I often hear those words together so I figured I'd give it a try). I was always afraid of foundations because I thought they looked cake-y. But not this one. It's lightweight and makes my skin so smooth. I usually just use this foundation to cover the bags under my eyes, random redness, and pesky pimples that pop up. On occasion, I'll use it on my whole face. 8. 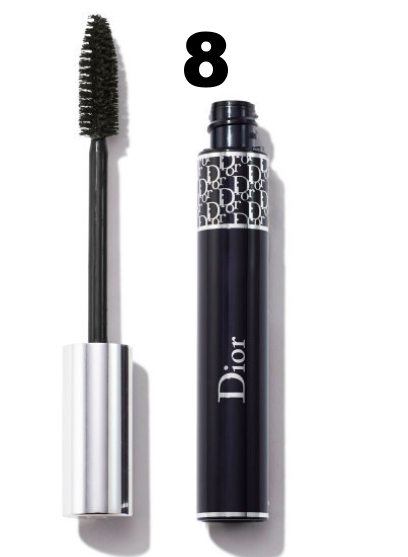 Diorshow Mascara - I've been using this mascara for quite a while. This mascara does an awesome job of adding great length and volume without looking too unnatural. I wear it in the brown shade (I'm pale and blonde and black mascara is a bit bold for me), but black would probably work best for most of you. 9. Badger Lip Balm - this is one of the only lip balms I've found that actually works. I put it on every night and morning. And in between. It's awesome. And only contains natural ingredients. 10. Clinique Quickliner - if I had to choose only one makeup item to wear, it would be this eyeliner. I wear this eyeliner every day in the Intense Ivy shade. 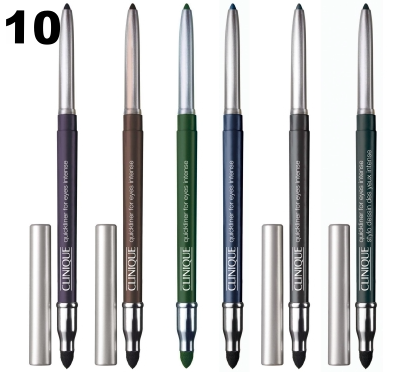 It's super easy to make a thin line on your lid with this eyeliner, which is what I like to do. And, it comes with a smudge brush on the other end for creating a smoky eye effect under your lids. Sweeeet. 11. Revlon Eyebrow Brush - I started using eyebrow brushes a few months ago, and now I can't go a day without one. Brushing my eyebrows with this eyebrow brush literally makes them look 2x thicker. I get asked sometimes if I fill in my eyebrows. Answer: nope, I just brush em. 12. Mac Blush - I go for the lightest shade in this blush for just a hint of rosy cheeks. Cuz I'm so pale, ya'll. 13. Revlon Just Bitten Lip Crayon - I don't usually wear lipstick, but when I do, it's a light smear from one of these lip crayons. They're matte and come in awesome shades and just a few dabs of one is intense enough for me. 14. Kiehl's Musk Oil - I know scents are very subjective, but I had to share this musk oil with you. It might technically be a men's scent, but whoever it's meant for, it smells friggin amazing and I'm obsessed with it. Fun fact: did you know that some people are incapable of picking up the scent of musk at all? It's true. 15. Victor and Rolf Flowerbomb Perfume - again, scents are subjective, but this here perfume is my everyday scent. I haven't gotten sick of it after 5 + years of use. This perfume is lightly sweet and floral scented and far from pungent and overwhelming. I love dis.